Last July we released the first part of the System Design series: Demystifying Systems. 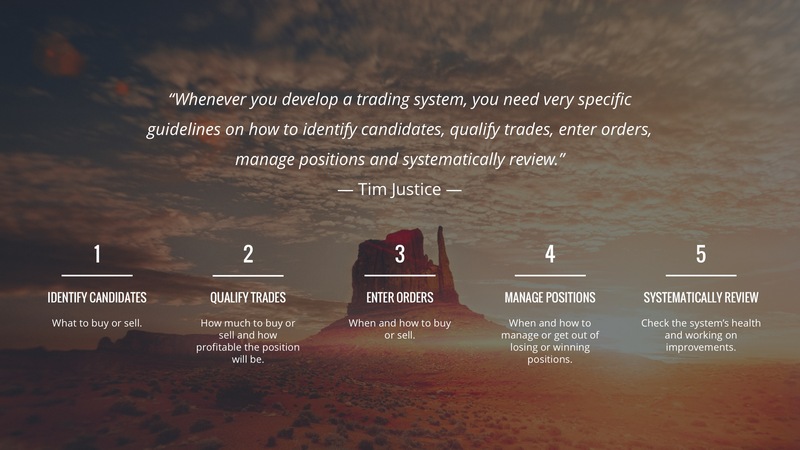 Now that systems, in general, are no stranger for you anymore we can handle how to put together a trading system, one that can easily be a core position inside your portfolio. If you think that building your own successful system will take years of studying and a mighty effort, well, think again. It only takes 3 steps to build a successful system of your own. From now on we’ll be referring to these steps as the MCO Framework. This is what we’ll be covering in this edition of the Trading Justice Newsletter. These are the very cornerstones of a good and reliable system. Each one of them brings many benefits to your trading business which will be discussed further down the road. From your first system to the last one, the MCO Framework has got to be the foundation. Let’s move on and start with the Mentor. Imagine you sitting next to a person who’s been trading, teaching and mentoring thousands of students for more than 10 years. That’s more than 10 years of hard work and experience wrapped up in mentorship sessions. Now picture yourself trying to work all by yourself, from ground zero. It’ll be like reinventing the wheel and you don’t want that. Mentors are shortcuts. A Mentor will help you with Whys and Goals. Without a why you won’t go too far. Without a goal, you will be adrift. It is the whys and the goals that will help you during hard times and will also guide you to become a successful trader. What do you want as a trader/investor? What are your goals for this year/this month/this week/today? What drives you to become a successful trader/investor? Our Coach Tim Justice put together this great video about starting with a why as a response to an email a student sent to him. We highly recommend you watch it. on how you will trade the markets. A Mentor will help you with that. This is what Mentors are for. Start with one of your mentor’s system. Although system development is more for intermediate to advanced level students, you can be a new trader and still have the opportunity of practicing systems right from the start. Just start with one of your mentor’s system. You will notice that trading strategies inside a system will help you avoid randomness. Killing randomness and bringing cohesiveness is one of the main benefits of trading inside a system right from the get-go. A Mentor will bring your attention to what matters. They will make you stay diligent, organized, consistent, focused on the control of your emotions, rules, execution, and data—lots of data—, sharpening the edges of your System-thinking approach. Accountability counts and proactivity builds momentum. If your Mentor tells you to place two trades, place four. Doubling or even tripling a mentor’s request will build proactivity and make yourself accountable. See how many trades you can handle at the same time and still be on top. Take the opportunity of being in a simulated environment and get on the edge of chaos. Know yourself as a trader. Know your own limits. I’ve never worked with a Mentor. Where should I start? That shouldn’t be a problem if you are part of a community of fellow traders and coaches like Tackle Trading. Many times you will hear the Coaches preaching system development, backtesting, forward testing and the like. There is a huge pool of knowledge waiting for you to be read, seen, listened to and learned from: coaching programs (to be released soon), live shows, trading systems, the Trading Justice podcast, the Clubhouse network, blogs and the famous scouting reports. Think about operational systems like MacOS and Windows. They are all systems, serving more or less the same purpose, both follow the standard definition of a system but what makes them so different and unique? The concept behind each one of them. There are at least three reasons why you should work with a Concept. The first one is that the Concept incorporates the system’s main goal and, because of that, it becomes the system’s ultimate mission. The Concept is the idea behind the system and it is this idea that holds together all the little things that work seamlessly as parts of the mechanism. The system works for the idea. Third and last, because the Concept incorporates the system’s main goal, it will be like having an assistant with AI capabilities at your disposal. All you have to do is ask the Concept whatever you need to ask in order to build or tweak your system. Combining assets with strategies, timeframe and market outlook can be challenging. Asset: Stocks | ETFs | Futures contracts | Currencies | Options contract etc. Strategy: Long or short stocks | Long or short options | Option spreads | News trade on Currencies | Buy and hold | Cashflowing on assets etc. Looks confusing? Not if you have a Concept. Replacing Income/Cashflowing – You won’t trade purely stocks because you want to combine them with selling OTM calls to take advantage of time decay and dividend payments or you won’t even trade stocks at all, only options contracts. Protecting buying power – Say you are afraid of what the future holds for the Dollar and you want to send your kids to study in Europe. You could set up a FOREX System to hedge against currency devaluation, protecting your long-term buying power. Knowing how to trade different assets and strategies is not enough to build successful systems. The Concept will narrow down the alternatives to the ones that will be essential for your system. All you have to do is ask the concept and it will answer you back with the most appropriate combination. The Concept will help you stay on the right track. Great ideas and great Mentors do not equal great systems. You can have the most creative and innovative Concept for a trading system worked together with the best available Mentor, however, if it lacks rules and execution, it will tank. After choosing a Concept, start a reverse engineering process, working backward to the rules that will make the system itself work. This is what the Outline is all about. By breaking down this phrase, we have the essential components every outline must have in order to be considered complete. This is where you’ll be choosing the assets you’re gonna be trading and will also be filtering them against a set of criteria. You are building your portfolio here. Picking candidates for your portfolio shouldn’t be a chore. You can rely on scanning tools like iVest+ or Finviz. You can use Tackle’s scouting reports as a powerful source for candidates and also participate on the Clubhouse, a network built specifically for traders. The possibilities are endless. Never skip any filtering process because you have an intuition that a certain candidate is a sure winning bet. Never trust your gut feeling to choose a candidate. You can be in love with Apple Inc., for example, but if it does not fit the criteria you should dump it. Don’t be random. Like on a football match, every candidate must be part of the team and must play according to the rules in harmony with other players to win the championship. This is not an every-man-for-himself situation. The list of criteria will depend on your system’s Concept. Sit together with your Mentor to work on it. Keep in mind that without building this list and analyzing asset by asset, you cannot move on and pull the trigger. This is an eliminatory phase. By the end of each run you must ask the question: IS IT IN ACCORDANCE WITH THE RULES? If YES, continue the process. If the answer is NO, discard the position. This is the one parameter you should care about at all times. By definition, liquidity measures how fast you can convert an asset into cash and vice-versa. You want to get in and out of a position real fast and have the best price available. Don’t get exotic here and stick with liquid assets. There are four basic ways to measure an asset’s liquidity: volume, bid/ask spread, open interest and strike price volume. As a general rule, the higher these numbers, the better, except for the bid/ask spread, in which case you want to trade the tightest spread available. This is where you’re going to analyze the trade to further pull the trigger. Diligence, consistency, and organization are key at this moment. You will be qualifying both entry and exit of a specific position against a set of rules you’re going to layout. total capital allocation, (2) the max loss per position and (3) the max number of simultaneous positions. Risk/Reward Ratio – Shoot for convexity. Make sure that if you lose, lose small and if you win, win big by setting the Risk/Reward Ratio. Size your potential loss against the potential gain. Probability of Profit (POP) – Make sure the odds are in your favor. The position’s POP will greatly influence the Risk/Reward Ratio perception. For example, a low-risk, high POP trade is the sweet spot, whereas taking too much risk on a low POP trade is exactly what we don’t want. As a first step, sit down with your Mentor and set the ROI targets for different timeframes: day, week, month and year. The profitability of a trade is a combination between four dimensions: (1) the ROI itself, (2) timeframe, (3) probability of profit (POP) and (4) position sizing. 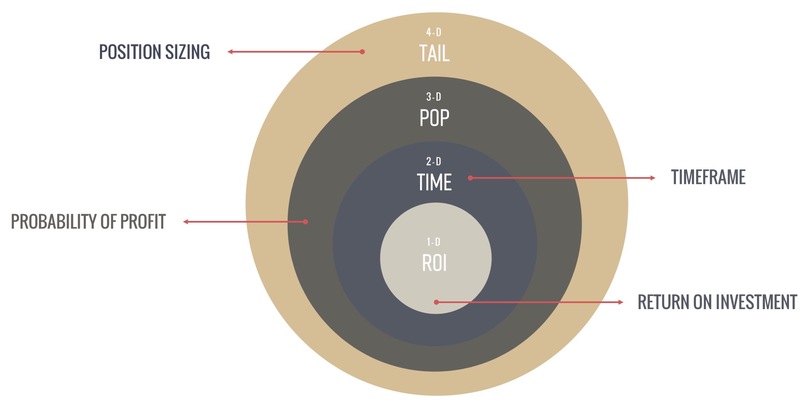 The ROI itself, alone, does not mean much if you don’t consider the other three dimensions of the equation. For example, two candidates can have the same ROI but completely different POP and position sizing. Choose the one that fits into your rules. This is also an eliminatory phase. By the end of each run you must ask the question: IS IT IN ACCORDANCE WITH THE RULES? If YES, continue the process. If the answer is NO, discard the position. Entering orders require that you lay out specific rules on WHEN and HOW to do it. The WHEN not only means time itself but the conditions under which you will trade the asset. The HOW refers to the act of button-clicking itself. Here you can layout very simple or very complex rules depending on the case. Relying on a Mentor’s experience and having a clear Concept for your system will be of great help at this moment. For the sake of clarity, managing refers to manage to keep the position opened whether if it’s a winner or a loser. Managing positions require that you lay out specific rules on WHEN and HOW to manage them. The WHEN here refers to a moment in time, a certain market condition, a signal, a level of a particular indicator, a price level, anything that leads you to trigger an adjustment. The HOW here refers to the mechanical means you’re going to use to manage the position. The HOW will always require a buying or a selling action that must be specified. Not all systems will require hedging rules, but if your system does, pay a very special attention to this topic. You can hedge a single position, a group of positions or even develop a system that will specifically hedge your entire portfolio. Like any other topic inside Managing Positions, you must specify WHEN and HOW to hedge a position, whether if it’s a winner or a loser. There are a large number of hedging strategies that you can use. Choose the best ones that fit your system together with your Mentor. Simply put, Systematically Reviewing is the process of collecting, breaking and analyzing data in order to check if the system is working as expected (a.k.a making money over time), find potential and/or actual flaws and find parts that lack improvements and work on the necessary improvements. For that, you will need to be disciplined, organized, diligent, consistent and develop a spreadsheet. Is there any risk of an assignment? Which positions show a profit? Which positions show a loss? Is my system bias in harmony with the market bias? If you are already placing trades and you can’t answer with confidence any of these questions, you should start thinking about organization. The good news is that it only takes 2 steps to get organized. Step One: Have a business routine – Like any other business out there, your trading business should have a routine that has to be followed to the letter. The keyword here is consistency. By repeating the tasks every single day, you create a habit out of it. Habit creates consistency and from it, your routine becomes a second nature. Developing a routine for your business is as easy as creating and following a to-do list. Step Two: Have a Trading Journal – A Trading Journal is not something superfluous. It is where you will log, crunch and analyze all your data so you can see if you are making money over the long run, which should be your ultimate goal. No need for fancy spreadsheets here, the few shared by the coaches are a wonderful starting point. Take the ones you most identify yourself with and start inputting your data. Develop something you’re comfortable using every day. The bottlenecks will show up. Get rid of them and continue with the same journal until you end up with the most suitable solution for your business. Running your system LIVE right from the start with real money is suicide. You should always go on PAPER first. The path we suggest you take is Backtest › Forward test › Go Live. The more time you dedicate running your system on the first two steps, the greater the chances of success. Nonsense. Backtesting uses historical data; it’s in the past, done, it’s over, and therefore, it’s static. You can’t change what has happened. Whereas Forward testing, although on paper, uses real market data, it’s alive, moving, rallying or selling off on each and every news headline. The psychological differences between the two situations cannot be underestimated. Uncertainty lurks when trading live. On the other hand, “you know the future” when Backtesting. Gathering data to back up your investment thesis is very important. The larger the data points you gather and the bigger the effort you put to crunch and analyze it, the better. That’s the only way you will know if your system is working. Let’s say your system is working but you want to make some changes. For example, you want to test another Delta on the short options, or an ETF instead of a stock to mitigate risk during earnings season, or another profit target, or another entry point. You want to improve your system, technically speaking. This is a natural consequence of any live system. It’s organic, it moves together with the markets. Nothing is perfect, everything can be improved. Markets change and so does your system. The same path we suggested at the beginning of this section applies now. Just adding the word “improvement” does the trick: Backtest improvement › Forward test improvement › Go Live. You don’t need to stop trading your system. If it’s making money, keep on trading and collecting data. While you continue with version 1 live, you test version 2 on paper. Traders, this is the MCO Framework, the very foundation of a good and reliable system. On the next and final edition of the System Design series, we’ll be wrapping up the entire series and also presenting the Four Horsemen of the Trading Apocalypse. You don’t want to miss it. See you next time! Want to grow better grass? Get a mentor.